So, I’m playing a Nippon Ichi strategy RPG again, albeit for the first time in years. The last time was back in 2012, when I played through Soul Nomad, which was very different from their previous releases, though still enjoyable. This time around, it’s something a bit more “traditional”: Disgaea 3: Absence of Justice, a PS3 game in which the Netherworld consists of a gigantic school, the Evil Academy. The main character, Mao, is a top honor student—as in, he never goes to class and typically spends his days lazing about—who aspires to defeat his father, the Overlord. Mao and the other members of the cast have the usual eccentricities, and overall, the tone tries its best to channel the smile-inducing spirit of its most successful predecessor, Disgaea: Hour of Darkness. So far, I feel it’s falling somewhat short. 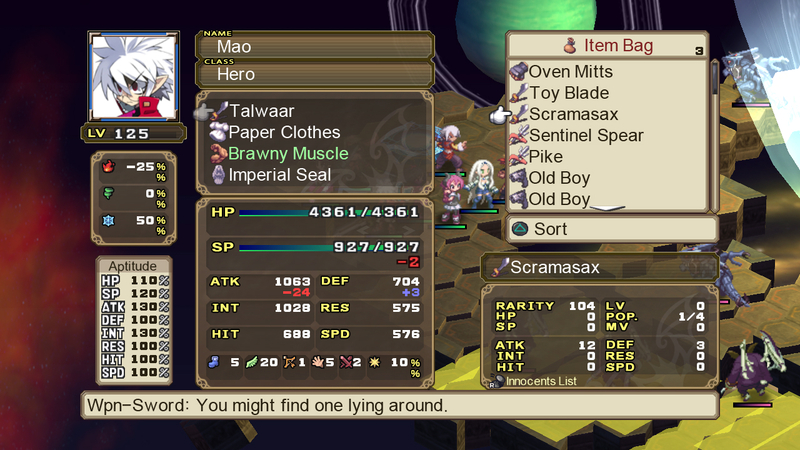 I like some of the characters, particularly the waylaid hero Almaz, but Mao is only a few steps short of being annoying; also, the story, while not bad, isn’t particularly remarkable, and relies a touch too heavily on fourth-wall breaking for some of its humor. Normally, knowing how I review games with prominent stories and characters, this might pose a problem. For me, a poorly-plotted story can discolor what is otherwise a wonderful experience, and appealing characters are typically equally important in such games. This is a Nippon Ichi SRPG, however, so what will ultimately make or break the game is its gameplay: the turn-based, grid-based, multiple-character-managing battles executed in a style that this studio is famous for. Usually, they get this right, though there have been some missteps as well. Phantom Brave, which features one of the best stories amongst all of Nippon Ichi’s games, had a terrible system which ditched the space-by-space grid-based movement and attacks for a more freeform style, but that was hard to use effectively (nevertheless, I liked the rest of the game so much that I want to give it a second chance sometime, and, seeing as how I don’t own the original PS2 version anymore, picked up the Wii port awhile ago). Makai Kingdom, which, on the other hand, had a story and cast which I hated, had a more refined version of Phantom Brave‘s system, but it was only barely less fiddly. It’s worth noting that Nippon Ichi has gone back to, and stuck with, grids ever since. 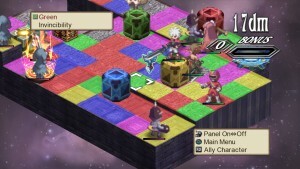 Besides grids, Disgaea 3 has the other trappings typically expected given its lineage, including a special field-based battle gimmick (in Disgaea games, this means the color-coded Geo panels and symbols/blocks), lots of character types to choose from, tons of equipment and other useful items, and a ridiculously high level limit of 9999. These systems are deep, and potentially overwhelming. The in-game information is presented very clearly within well-organized menus, with the most important bits made suitably prominent, and even so, it can be a lot to take in at once. 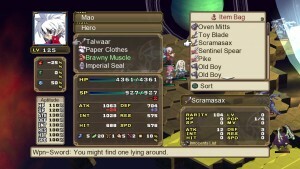 It’s no surprise that Disgaea games are, usually derisively, compared to spreadsheets (and also that some players make spreadsheets to get the most out of a playthrough), but this is only part of the journey. Micromanagement leads to some pretty fun rewards in battle: giant explosions and magical effects from special attacks, useful bonuses that rack up depending on how many chained and combo attacks are pulled off, and the numbers that appear whenever most any action that doesn’t involve movement between panels is executed. Seeing these numbers climb higher, particularly after a carefully arranged Geo panel and block sequence is set into motion, is a major part of where the fun lies. Disgaea 3 and its ilk are not so much about spreadsheets and the statistics they contain, but making satisfyingly big numbers out of them. It is strangely capitalistic in this way, although more overt signs of capitalism—stores and the like—are presented in typical fashion otherwise. It is the sort of game which I have been away from for far too long, but also, like so many other information-rich types, one which I should only indulge in occasionally, lest I start regularly seeing numbers in my sleep. Aside from the expected refinements made to the base formula (for better or worse), it’s the same sort of cozy, crazy Nippon Ichi SRPG I’ve always preferred. I’m only just starting the fourth chapter now, which means I should be about a quarter of the way through, by Disgaea standards, so there’s still a lot of room for the story to improve. I hope it does, but I wouldn’t begrudge the story too much if it never rises above its current mediocrity. Just keep the controls straightforward, the information tidy, and the effects and numbers captivatingly bombastic, and I’ll keep on happily playing until the credits roll.